(From Olympus lens literature) The interchangeable Zuiko Digital 40-150mm f/3.5-4.5 lens (equivalent to 80-300mm in 35mm photography) is perfect for everything from portraits to sports scenes. It features a 3.8x zoom, a f/3.5-4.5 brightness for effects like background blurring and compression, a new multi-coating and reliable metal lens mount, along with 13 elements in 10 groups and a weight of just 15.75 oz. / 425 grams (approx.). This is the second lens that ships as part of the two-lens kits with the E-500. 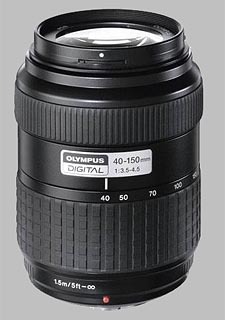 (The first is the 14-45mm f/3.5-5.6) Offering a range of angular field of view equivalent to that of an 80-300mm lens on a 35mm camera, this is a pretty good telephoto, about as long as most users are likely to need for common shooting situations. Thanks to the small dimensions of the Four Thirds sensor, it's also a surprisingly light and compact lens. Looking at the interactive blur plot, we see that the Olympus 40-150 does pretty well across most of its focal length range, but softness at maximum aperture does increase noticeably as you go from 100 to 150mm. As we've often found with inexpensive lenses, stopping down a couple of f-stops makes a substantial difference in sharpness across the board, and the 40-150 is actually a very good performer when used that way. As is also generally the case, the lens gets softer across the entire frame and at all focal lengths when stopped down to its minimum aperture of f/22, due to diffraction limiting. - But the degree of softening at minimum aperture isn't as severe as the worst we've sometimes found in other lenses. Where the 40-150mm does get a little wild and woolly though, is in the area of chromatic aberration. Starting out from a pretty low value at the 40mm end of its range, CA drops slightly at 48mm and then increases fairly rapidly as you move to longer focal lengths. At 150mm chromatic aberration is rather high, although for the most part you'll only notice it around the edges of the frame. Geometric distortion in the 40-150 ranges from a slight barrel distortion at the wide angle end (about 0.3%) to a fairly noticeable pincushion distortion (also about 0.3%) across much of the longer end of its range. (The inflection point of zero distortion is right around 48mm, with pincushion distortion increasing fairly rapidly up to about 68mm, and then more slowly as you zoom to 100mm.) Uncorrected vignetting or shading is pretty high at large apertures across the entire focal length range, varying from 0.25 to about 0.4 EV. The shading decreases quite rapidly as you stop down though, to less than 0.2 EV at f/5.6 for all focal lengths, and to an imperceptible 0.1EV or less from f/8 onward. Important to note though, is that the in-camera shading compensation offered by the E-500 and E-1 bodies can almost completely eliminate the shading or vignetting seen in the above tests. Overall, this lens falls about in the middle of the range of inexpensive ~50-200mm zooms that we've tested. It falls short of the surprisingly excellent Nikon 55-200mm f/4-5.6, but beats the Canon 55-200mm f/4.5-5.6 quite handily, particularly at longer focal lengths. When you factor in the very low incremental cost of acquiring this lens as part of a bundled package with the Olympus E-500 body and the 14-45mm f/3.5-5.6, it's a really exceptional bargain. Great lens. It is cheap as hell, and you get 300mm equivalent. That is a joke! it is much better optically than the later version that have plastic mount, and which is slower and optically inferior. This lens is really usable, especially if you have hood. Not in the 50-200 ballpark, but still a fantastic lens for the price. Unlike the 14-45 which came with my Olympus 330 too, this is a very good lens. The construction is very simple, which might be a drawback because the front of the lens turns while focusing, and the zoom ring is a bit loose -- it almost zooms out on its own when you point the camera down. However, the simple design might be the reason that it performs so well. Images are nice and crisp (one can see it already in the viewfinder), and there are no serious image quality issues at the different f-stops, nor at the various focal lengths (though I also discovered that beyond 100mm the lens is slightly less crisp). I tended to prefer to use this lens more and more over the 14-45 lens. But now I have the 12-60mm/f2.8-4 lens which solves the problem for wide angle shots. I used this with a E-300 when they first came out. My first impression was that its a great, compact zoom lens with a pretty wide aperture. It performs well optically too! My only gripe is its AF which can be slow and noisy. Otherwise an excellent lens for the 4/3 system. This is amateur tele lens that in pair with ZD 14-45 3.5-5.6. It is smaller and lighter that older heavyweight and much more expensive - ZD 50-200 2.8-3.5. This lens perform better than ZD 50-200 when stopped down and won't resolve 1400 lw/ph with E300 (imatest resolution target shot at raw processed byc dcraw and lightroom with no sharpening at all). This lens satisfied E1/E330 sensor resolution and possibly E300/E500 sensors but not E400 sensor. I bought this lens for my E-300 and I am very satisfied. This lens is an excellent performer and it's low weight makes an interessting travelcompagnion. For daylight use this lens is quick enough, however I find it a bit slow indoor. I bought this lens as part of the e-300 2 lens kit. I was pleasantly surprised by the quaiity of the lens. I had only seen the 14-45 on demo cameras. I use this lens alot. The 40mm end is almost wide enough for normal photography and is 2 stops faster than the 14-45 at 45mm. This lens travels well because of it's size. F4.5 is fast enough for most situations. Very good centersharpness, excellent edge sharpness and very low chromatic abberations. Much better than my Canon 70-210 that I had on my Digital Rebel.